That guy in the last row looks awful happy considering the person in front of him has his seat reclined the whole way. Must have popped a Vicodin. Yeah well, at least he's not dying of plague spots and dysentery. I did not travel much, but when I at last tried using airplane to visit my friends 800 km away instead of cheaper train--I was surprized how fast it was. The flight was less than hour long, it was about twice less than going on a bus to the town 100 km away. 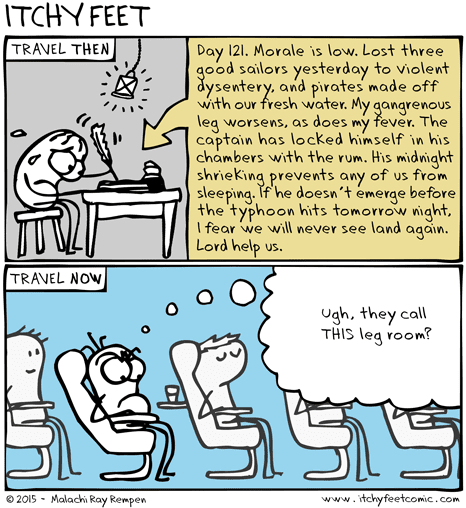 Today, maybe with some leg room discomfort, one can travel to other side of the globe in about 12 hours. The modern world is truly fantastic. The dude from the news who paid for "legroom" did not recline his seat, he put a device on the seat in front of him that kept it from reclining. The airline took money from him for giving him more "legroom". All the responsibility for the situation is on them for bullshitting people. He just gave them a slap for that.